Before we get to the 2017 Lincoln MKT, here’s a little barstool trivia for you. Did you know the same man, Henry M. LeLand, started both Cadillac and Lincoln, America’s two premier luxury automotive brands? It’s true. Mr. Leland started Cadillac in 1902 and Lincoln fifteen years later. First introduced in 2010, the Lincoln MKT is a full-size seven-passenger SUV offering unique style, an upscale interior, and a twin-turbo V6 making up to 365 hp. Plus, Lincoln now offers pickup and delivery of your vehicle for all service and maintenance, as well as a loaner Lincoln while your car is in the shop. Built in Canada, the family-friendly 2017 Lincoln MKT competes against a long list of popular, high-quality SUVs including the Acura MDX, Audi Q7, BMW X5, Lexus RX, Cadillac XT5, Buick Enclave, Volvo XC90 and Mercedes-Benz GLE. Let’s take a closer look at the 2017 Lincoln MKT. 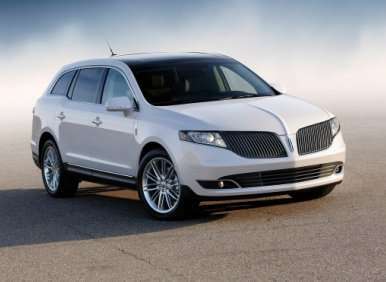 Unlike most SUVs, the Lincoln MKT isn’t offered in a long and confusing list of trim levels. Prices start at $44,455 including $925 destination charge for the front-wheel-drive model powered by a 305-hp 3.7-liter V6 with 19-inch wheels. Standard features include power heated and cooled front seats, a sunroof, power side and rear sunshades, a three-zone climate control system with rear seat controls, leather trimmed seats and a power liftgate. Step up to the twin-turbocharged 3.5-liter V6, which makes an awesome 365 hp, and you also get all-wheel drive and other desirable equipment, including navigation and a heated steering wheel. This combination drives the price up to $49,925, but makes the MKT one of the most powerful suvs in its class. It accelerates from 0-60 mph in about 6.0-seconds. There is no hybrid version available. All models come with a smooth shifting 6-speed automatic transmission. And the only optional equipment available on the base model are inflatable second-row seat belts. Large and lavish, the 2017 Lincoln MKT offers a roomy interior and more rear seat space than many of its competitors. It seats seven easily, and its third row can accommodate adults if they don’t play for the Warriors. Our test vehicle was equipped with second row captain’s chairs, which limit seating to six. Rear passengers appreciated our test vehicle’s rear climate controls, window shades and heated and cooled rear seats. A refrigerated second-row console is also available to keep those juice boxes chilled. Parents of small children will also like the Lincoln’s easy to reach LATCH connectors in the outboard seats and an easily accessed upper tether anchors on the seat backs. The MKT has not received a crash-test rating from the National Highway Traffic Safety Administration, although it performed well when tested by the Insurance Institute for Highway Safety. Still, many of its competitors enjoy higher safety ratings. Much like its exterior, the Lincoln MKT’s interior is understated. Although the design isn’t as modern as some others in the class, the Lincoln’s interior is well appointed, well assembled and comfortable. Control placement is excellent, and all the knobs and switches function with exactitude. The leather-wrapped three-spoke steering wheel feels good in your hands, and the digital gauge cluster, which is easily configurable, delivers information clearly. I like the way the speedometer is center mounted. I found the driver’s seat to be well shaped and supportive. Visibility is outstanding, and the seat heaters warm up quickly and dish out plenty of BTUs. The driver’s seat is height-adjustable for shorter drivers, who will also appreciate the available power-adjustable pedals and the standard tilt-and-telescopic steering wheel. The wood trim plays well, and the interior’s abundance of chrome trim added charm to our test vehicle’s black interior. With seven aboard, the 2017 Lincoln MKT offers 17.9 cubic feet of cargo space behind the third-row seats. That’s plenty for a suitcase each — more than you get in most of its three-row competition. The Lincoln’s third row is split 50/50 and easily folds flat, expanding available space to 39.6 cubic feet, about the same as you get in a Volvo XC90. Lincoln even equips the turbocharged model with a power-folding third row, which drops or raises the seats with the push of a button. With both rows folded out of the way, there are an impressive 75.9 cubic feet. Still, in this configuration, the Volvo offers more space, and the Acura MDX offers the most at 90.9 cubic feet. Although Lincoln offers a hands-free power liftgate on its other SUVs, it’s not available on the MKT. Interior storage is generous. The center console bin is deep, and the door pockets and front-seat cupholders are large. Ford’s Sync infotainment system, while not always perfect, has been continuously improved and today’s version called Sync 3 is the finest the company has ever brought to market. Its menus are simplified and its reaction time to your inputs has been quickened. It’s also compatible with Apple CarPlay and Android Auto. Although the MKT’s touchscreen is small for the class, it’s large enough and simple to use. If you have a smartphone, you won’t have any issues. Bluetooth and navigation with voice recognition are standard on every MKT, as is onboard WiFi. Still, tech junkies should check out the Volvo XC90, Acura MDX, and Audi Q7. Those who want the MKT to do the driving for them will be disappointed. Lincoln doesn’t offer autonomous technology on the MKT, except for Active Park Assist. If you need your three-row SUV to go, stop, and steer on its own, shop the Volvo XC90 and the all-electric Tesla Model X. 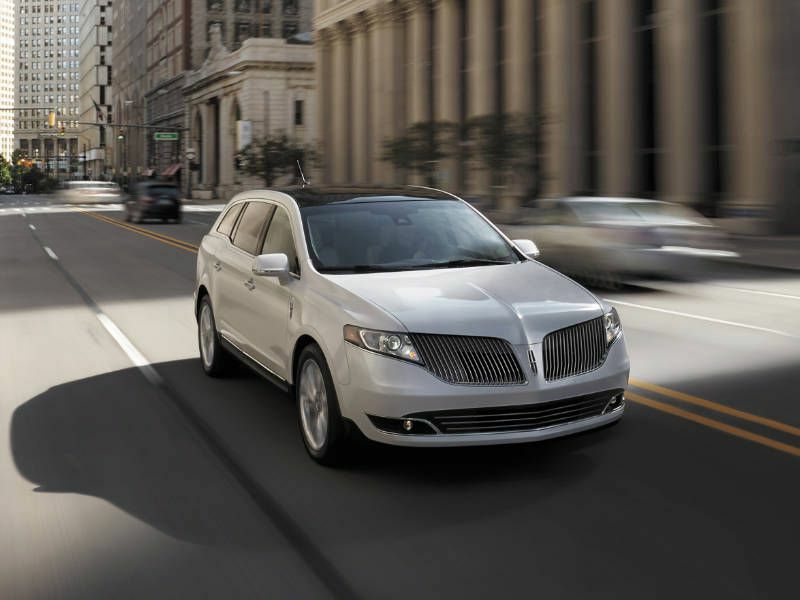 It may not drive itself, but advanced technology is found in the Lincoln MKT’s many active safety systems. Many are standard on the turbocharged model, but a few are extra cost options. The turbocharged model comes with rear parking sensors, a backup camera and a blind spot warning system and cross traffic alert, which warns if another vehicle approaches from the side as you back out of a parking space or your driveway. Our test vehicle was also equipped with the optional $2,000 Technology Package, which added adaptive cruise control, lane keep assist, which will actually help steer the car back into its lane, and forward collision warning with brake support. That system warns you if a vehicle or object is dangerously blocking your path and it can also apply the brakes to help avoid the accident. Fast, comfortable and quiet, the 2017 Lincoln MKT is a full-size vehicle and it feels big from behind its steering wheel. Our turbocharged test vehicle was shockingly quick off the line. Merging on the highway, even with the MKT loaded with people and things, is easy and stress less. It’s fun to put your foot into the throttle and feel the thrust of the turbocharged engine. Still, as fast as it is, the MKT is more luxurious than it is sporty. The ride is plush, and the vehicle’s driving character is relaxed. It handles well enough and its steering is responsive, but it’s not as fun to drive as the BMW X5 or sporty Acura MDX. Highway cruising is the MKT’s forte. Fuel economy is also below average for this class. The MKT’s 6-speed automatic, which doesn’t offer as many gears as the transmissions in the competition, holds it back. Even Ford’s F-150 pickup truck now has a 10-speed automatic. The front-wheel drive MKT is rated 16 mpg city and 24 mpg on the highway. The all-wheel drive turbocharged model, like our test vehicle, is rated 15 mpg city and 21 mpg highway. Lincoln’s design language is often like the folks on the Discovery Channel’s Naked and Afraid survival game show: Hard to understand and not always easy on the eyes. Understated to a flaw, the exterior design of the 2017 Lincoln MKT isn’t unattractive. In fact, it’s quite handsome, but it’s about as unexciting as you can get. From the curb, it’s more minivan than SUV. 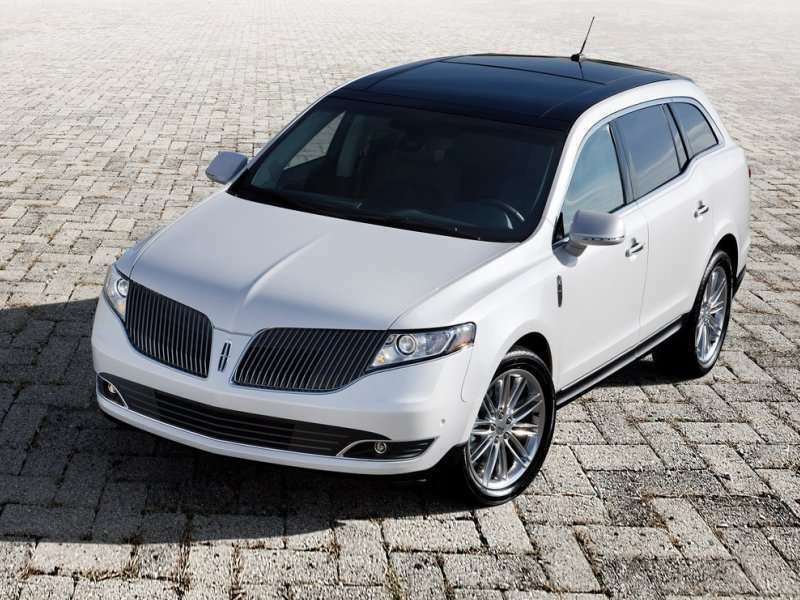 Although the waterfall grille is pleasant, and the lack of roof rails give it a sleek silhouette, Lincoln’s tall sides and Kardashian rump don’t do it many favors. Still, the details are there. I like its abundance of chrome trim, large dual exhaust pipes, and oversized 9-spoke wheels. The Lincoln star logo badges on the front fenders is a creative touch, and the step in the greenhouse behind the back doors is quite cool. I just wish for some more muscularity in the shape of the car. Lincoln’s smaller SUVs, the MKC and MKX, are far more attractive, and its mechanical twin, the Ford Flex, is more impressive. Comfortable, family-friendly and luxurious, the 2017 Lincoln MKT is a solid choice in the extremely competitive three-row luxury suv segment. It’s easy to be tempted by the low starting price and 305 hp of the base model, but the more powerful engine, all-wheel drive and more extensive standard features of the turbocharged model are worth the extra money. And the fuel economy penalty is minimal. Also, get the optional Technology Package. It’s a solid value at $2,000.